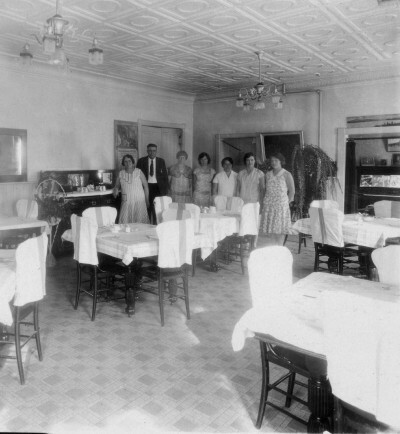 "The Wold Hotel, Mahnomen County, Minnesota"
My grandparents, Emily and Thomas O. Wold, purchased the Wold Hotel (also known as the Mahnomen House and Mahnomen Hotel and later, under different ownership, the Letford Hotel) in 1918. It was a three story, 35 room hotel which had been transported via flatbed rail car from southern Wisconsin and reassembled in Mahnomen by the Soo Line Railroad in 1904. The Wold family had farmed in Kittson County and owned and operated the Commercial Hotel in Kennedy, Mn. Shortly after the family moved to Mahnomen, Tom Wold's sister and brother-in-law, Lena and John Peterson managed it for them. 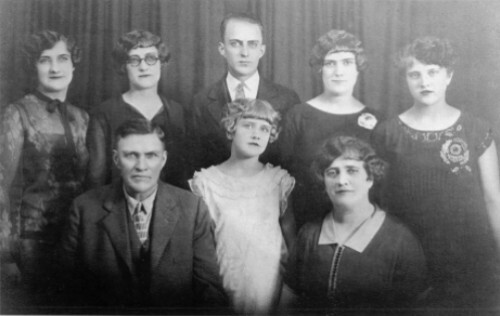 The Wold family moved to Crookston for about four years before returning to Mahnomen. The three eldest Wold daughters had married and left home. Daughters Violette and Genevieve both graduated from Mahnomen High School. My family history says "Tom and Emily spent 25 years in the hotel and restaurant business. They were good managers as well as warm and outgoing people. The guests enjoyed their hospitality and salesmen loved to play "whist" in the evenings with Tom and Emily. During the depression years careful management of monies was a necessity. After local banks failed, checks were not honored. Tom supplemented food for the hotel's restaurant with a garden and the chickens he raised behind the hotel. In 1936 retirement became a reality; Tom and Emily traveled to see their daughters in California. In 1938 they boarded the cruise ship "Oslofjord" and voyaged to Norway where they visited all the farms of their forefathers. 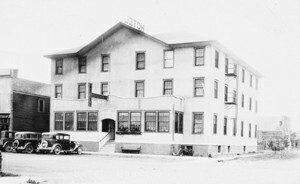 The Wold's son, Theodore and his wife, Ruby, managed the hotel until it was sold in 1939. The elder Wolds moved to Yuba City, California"
Soon, Ted was active in the 9th District Young Republican party politics. As County party chairman, he delivered Mahnomen County to the election of Harold Stassen as Govenor in November of 1939. Ted, his wife and daughter moved to St. Paul where he became Director of Minnesota Hotel and Restaurant Health Inspection. Daughter Violette graduated from the University of Minnesota and married Neil Keister. They lived in Minneapolis. Daughter Genevieve graduated from St. Olaf College and married Rev. Alfred (Steve) Syverud, a Lutheran minister in Kenyon, Mn. 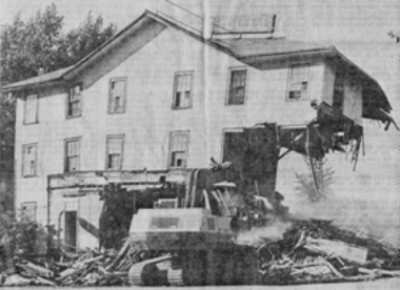 A hotel that had been a landmark in Mahnomen, Minn., for 71 years has been torn down to make room for an apartment building. Known as the Letford Hotel since 1939, and the Mahnomen House before that, the 35-room building had been moved to Mahnomen from Wisconsin in 1904. No one is quite sure where in Wisconsin the building came from, but it is known that it arrived in two sections on railroad flatcars. The first all-modern building in Mahnomen, the hotel thrived into the 1950's because of the railroad. Train crews were changed at Mahnomen and headquartered at the hotel. But as passenger services declined, so did the hotel's business. 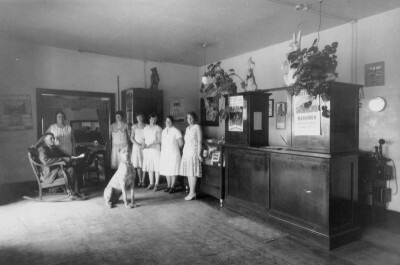 Here are two photographs of the Mahnomen/Wold Hotel's lobby. Tom and Emily Wold, owners, appear on the left of both photos. My, these photos bring back memories of my youth what with the decorative tin ceiling panels and the heavy wood furnishings.